No one expects to suffer from a debilitating injury and lose their ability to work and cover daily expenses - but it happens. With Disability Insurance, you can give your employees and their families peace of mind in knowing that they won’t lose everything when something unplanned happens. If an illness or injury puts you or one of your employees out of work, Disability Insurance ensures a continued source of income. Read on to see if it’s is something you need for your business and employees. Disability Insurance covers a portion of an employee’s income when they lose their ability to work due to a non work-related illness or injury. There are two types: short-term and long-term disability plans. Employers can offer either or both depending on their needs. Short-term disability covers a portion of the policyholder’s salary for a short period, which can vary depending on the policy. However, it’s usually covered for three to six months after the incident that left them disabled. Long-term disability usually comes into play when the employee holding the policy is disabled to the point of being unable to work for at least six months. It can be extended for years, even until the policyholder retires or reaches the age of 65, in which case benefits will end. Many business types should consider disability insurance particularly important. Physician disability insurance, for example, is important for healthcare professionals who recognize the difficulties that disabilities can impose on an individual. Disability insurance for self employed contractors is also a good idea, considering the many dangers that exist in contracting work. Many policies also cover rehabilitation costs that help employees transition back into work faster. You employ women of childbearing age who might benefit from paid maternity leave offered through short-term disability. It replaces income lost due to injury from a catastrophic accident or illness beyond 90 days. It generally replaces 60 percent of the policyholder's income from the previous year, up until retirement age (65 years old). This type of insurance offers an important benefit if your business employs female employees of childbearing age: paid maternity benefits. Short-term disability covers normal childbirth, ensuring that your employees will be partially compensated while they are on leave. Short-term disability due to injury If an employee is injured in an accident outside of work - like, for example, a car accident - they would be covered by disability benefits. Long-term disability caused by illness If your employee is unable to work for an extended period of time longer than six months due to a non-work-related illness. Maternity leave If your employee has a child through normal childbirth, they can receive short-term disability benefits. Optional long-term disability services, such as personal care assistance, 401(k) contribution benefit, spouse disability and dependent disability. What Does Disability Insurance Not Cover? Disability Insurance does not cover work-related injuries. It’s important to note the distinction between it and Workers Compensation Insurance. While Workers Compensation Insurance covers your employees for accidents that occur on the job and work-related illnesses, this type of insurance covers employees who are incapacitated due to accidents, injuries and illness that happen outside of work. Another thing that is important to pay attention to when purchasing this type of insurance for your business: how the carrier defines “disability.” There are two definitions here. “Own occupation” coverage provides benefits when employees aren’t able to perform their current job - even if they could do something else. This is preferable from an employee standpoint. The other type is “any occupation” coverage, which only offers benefits when an employee is disabled to the point of not being able to work at any job, period. Read the fine print and determine which type of coverage is best for you. Mental and nervous disorders are also often excluded from disability coverage. What Are the “Limits” on a Disability Insurance Policy? Short-term disability benefits are typically paid from three to six months after an accident or illness that makes an employee unable to work. Long-term disability benefits can be extended for years, however they won’t apply once the policyholder retires or reaches age 65. Disability benefits are usually limited to 60 percent of the employee’s wages from the previous year. 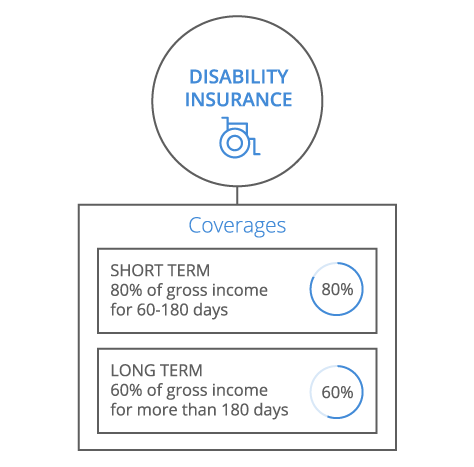 The cost of both long-term and short-term Disability Insurance usually falls between 0.25 and 0.5 percent of total compensation for companies of all sizes. As a small business owner, you should assess whether you can afford to offer both to employees. Offering this type of benefit is important for retention purposes, as rates for group plans are generally less expensive than individually-purchased policies. There’s also the benefit to the business of getting employees back to work as quickly as possible. The rates for an insurance policy vary depending on the industry of your business. Disability insurance for physicians, for example, will not cost the same as for mail carriers. This is affected by the perceived risk of workers in your industry, as well as the stability of the workforce. However, the size of your business doesn’t matter: as a small business owner, you are subject to the same rate as a large national corporation. Physicians disability insurance for a small practice will therefore pay the same rate as a large, privately run hospital. If you’re unable to provide and pay for group Disability Insurance to all employees, providing individual coverage or voluntary employee-paid coverage is an option that should be considered. Additionally, many small business owners purchase personal insurance policies for themselves as a type of business overhead insurance. This ensures their business can run while the owner is recovering from a disability. It covers standard business expenses, typically including payroll, utilities, rent, etc. However, the salary of the business owner itself would not be covered. Umbrella Liability can be a great solution for a business that needs more liability coverage than what is offered in their General Liability, Employer’s Liability or Auto Liability Plan. Umbrella coverage can be purchased as a standalone policy or can be bundled with a General Liability policy. This insurance provides a business with protection should a mistake have been made while delivering professional services. Your General Liability policy will not provide you with this level of protection, so if your company gives advice or provides contracting services you may need this insurance. The directors and officers of a privately-held company are at risk from suits by a variety of different people, such as customers, competitors, suppliers and government agencies. However, the greatest number of lawsuits against directors and officers come from the employees of a company itself. Directors and Officers Insurance covers your management team, should things go south. You’ll often find D&O packaged with EPLI. EPLI is a liability insurance that covers wrongful acts, such as wrongful termination, discrimination, sexual harassment and retaliation. This insurance may also protect your business from other employee-related claims, such as deprivation of a career opportunity, defamation, invasion of privacy, failure to promote, and negligent evaluation.